World Class Taylor River Fly Fishing, Gold Medal Quality Waters, Great Accommodations and Fine Dining. Our mile of Taylor River and tributaries has been said to be "twice the fishing at half the price" of the Frying Pan near Aspen for trout fishing. There's one incredible experience after another amid the alpine splendor of Harmel's Taylor River Resort. Harmel's Ranch Resort's trophy fishery is known as the "Rainbow Heaven". Fed by the high mountain lakes (Taylor and Spring Creek Reservoirs), Harmel's Gold Medal waters are at the confluence of Spring Creek and Beaver Creek and the famous Taylor River. Just downstream, the Taylor meets the East River to form the Gunnison River and Blue Mesa Reservoir, Colorado's largest lake. At an altitude of 8,412 feet, and surrounded by 1.7 million acres in Gunnison National Forest, Harmel's has posted and private rivers, streams, beaver ponds, lakes, and brooks to choose from. 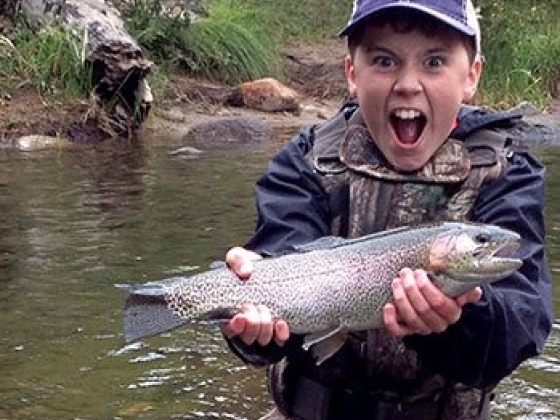 We catch BIG FISH: Rainbow, German Brown, Cutthroat, and Brookies, right out your cabin door. 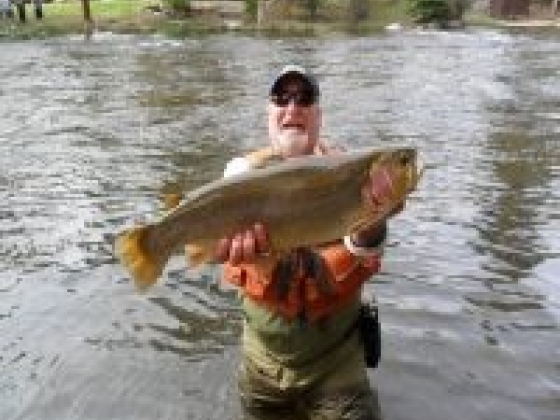 Our Taylor River fly fishing guides and outfitters are equipped to satisfy your every fishing need and desire. From an all day horseback ride to our overnight pack trip camp, our remuda of quality trail horses take you to the most beautiful vistas of our canyon and beyond. 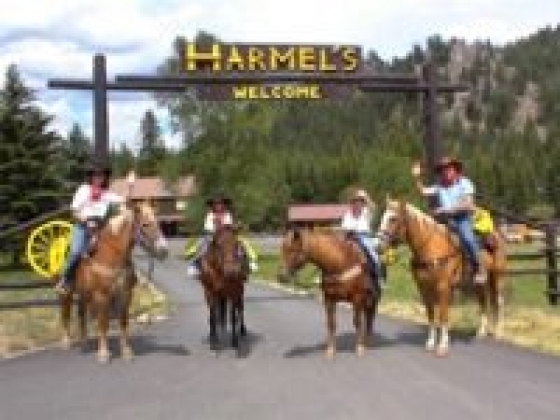 Harmel's is the center hub of Gunnison Country's whitewater adventures and rafting float trips. We also offer rock climbing, massage therapy, and we are pet friendly! Harmels Fly & Tackle shop is located in our gift & sundries store. Casting lessons, and guide service available by appointment. All levels welcome from the beginner fisherman to the most seasoned fisherman. Our Fly Fishing fees are: 2 hr lesson: $70/person 3 hr walk-wade trip: $100 (first person) 6 to 7 hr walk-wade trip: $200 (first person) Both walk-wade trips are 1/2 price for second person with same guide Rod & wader rental: $30/day Harmel's Taylor River Guides will teach you all the ins and outs of rigging, casting and catching some of the biggest rainbow and brown trout in Colorado. Lessons and gear are available and our friendly guides lead and give instruction on the river two times per day Monday through Saturday. Now it's just you and the river, fly rod poised and ready for the perfect cast into the most beautiful hole on the stream. That's when you need your concentration, no need to worry about the rest of the family; there are many other ranch activities to occupy their time. 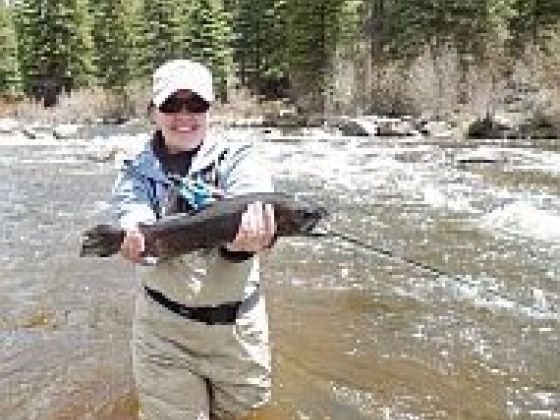 Fishing Seasons Spring Fishing - Be among the first on the river to catch the two to three pounders stocked for the Summer. Summer Fishing - Dry fly fisherman's heaven. Morning and afternoon hatches bring the hard fighting rainbows to the surface for hours of fishing bliss. Fall Fishing - Lower water flows, the changing colors and crisp mornings highlight the fly fisherman's prime time of the year. All of Harmel's guest accommodations are modern, beautifully appointed and strategically located on the ranch. There are 37 different units with a total of 150 guest capacity. They are three plans to choose from: Fisherman's Holiday, American Plan, and Run of the Ranch. Seventeen of the units have kitchens; all units are equipped with refrigerators and coffee makers. All linens and towels are furnished and kitchens are fully equipped awaiting your arrival. All units are reserved on a first-come first-served basis. No matter what plan you have opted for, all of our accommodations are available to you and all of our guests are welcome to eat in our dining room. Our units are occupied according to the size of your party and guest desires. There are 22 different floor plans accommodating from one to nine guests. Other Activities From swimming in the heated pool, whitewater rafting, rock climbing, to taking a therapeutic massage or horseback riding, we have the activity for you and your family. Plan to enjoy the cool mountain air on horseback. Trail Rides daily for every experience level, or go on the overnight ride to the high trail camp. Harmel's Junior Wrangler available for kids 8 and older. Each program allows the whole family to enjoy the most memorable vacation ever! Colorado is blessed with over 9000 miles of rivers and creeks, but only 168 miles of these are considered Gold Medal Water. The Colorado Wildlife Commission has designated these stretches of water as offering the greatest potential for trophy trout fishing. * The official criteria for Gold Medal Water is 12 trout per acre over 14" or 60 lbs. of trout per surface acre. Our stretch of the Taylor River meets or exceeds this definition and the certification process is underway. Harmel's Taylor River Habitat was designed and constructed by Bob Rosette, world renowned for his lifelong work to save America's rivers and fisheries. Due to Harmel's investment in the Taylor River ecosystem, the habitat supports 6 - 10 times the fish population, compared with unimproved stretches of the river. Working with the US Corps of Engineers, Harmel's designed fish dams and dead falls. Then the experts strategically placed boulders and created resting pools. All these "improvements" actually have helped to restore the natural habitat to its historically productive levels.